Published On March 9, 2015 | By We Love Brighton | Only in Brighton! Landlord brings in renowned graffiti artist to paint his house after Council’s call to tidy up properties near London Road. 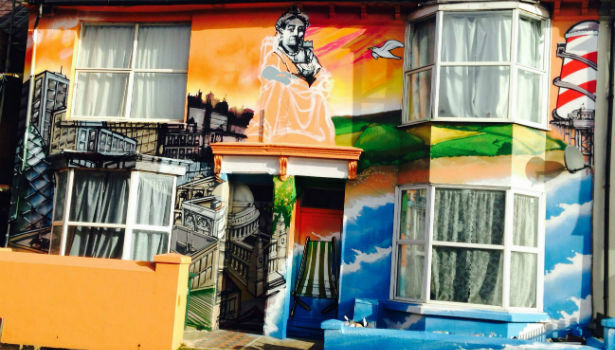 Landlords of properties on Viaduct Road were recently sent letters telling them to tidy up their properties as part of the London Road regeneration but one Landlord took things a step further by bringing in renowned Brighton graffitti artist Aroe MSK to paint a huge mural on the theme London to Brighton. Aroe MSK is well known in the City for his work which includes a Star Wars mural of At – Ats (now removed) and the Run DMC mural in Kensington Street. More recently he has also worked on the i360 hoardings. 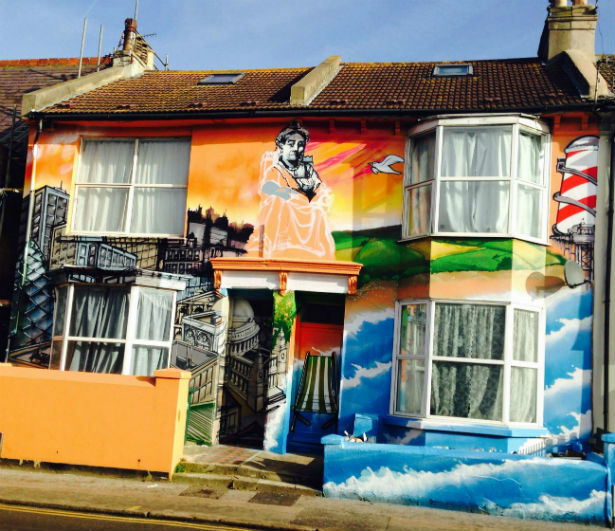 The mural features landmarks such as Beachy Head Lighthouse along with a tattooed Queen Victoria, tube trains and a British Bulldog.